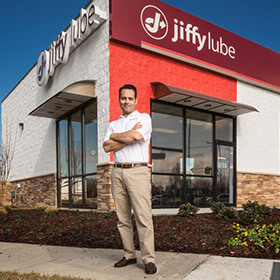 Patrick Southwick Named President of Jiffy Lube International, Inc.
HOUSTON, February 1, 2018 – Patrick Southwick has been appointed president of Jiffy Lube International, Inc., a wholly-owned indirect subsidiary of Shell Oil Company. Southwick is responsible for the strategic direction of the automotive service provider including management and growth of the 2,000 independently owned and operated Jiffy Lube service centers across the U.S. and Canada. Over his 15 years at Shell Oil Company, Southwick has served in numerous strategic and operational roles in North America and abroad including Global Marketing Manager for Indirect Markets; Regional Sales Manager; and as a consultant within Shell’s U.S. Strategy & Portfolio and Global Strategy and Portfolio organizations. Prior to joining Shell Oil Company, Southwick worked for Citizens bank in both Boston, Massachusetts and Providence, Rhode Island. He holds a master’s degree in business administration from Penn State’s Smeal College of Business and a bachelor’s degree in business administration from University of Massachusetts at Amherst – Isenberg School of Management.